Here’s what’s happening in the world of television for Tuesday, December 4. All times are Eastern. The Flash (The CW, 8 p.m.): It’s been a long road for the superhero show that was really fun, and then pretty dull, and then sort of silly, and now it’s... all of those things? As with any show that reaches that major milestone—once the point at which a show was ready for syndication—there have been high highs and low lows, with lots and lots of in-betweens. 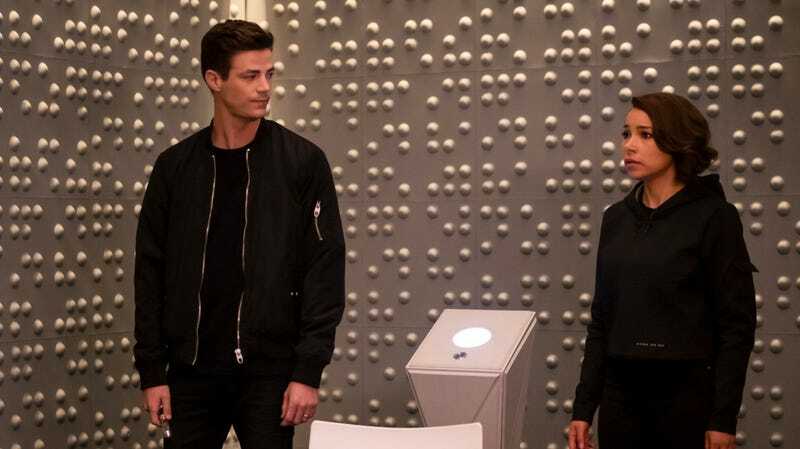 But even when The Flash has been mired in dour storylines, or when Barry Allen (Grant Gustin) has repeatedly made the same mistakes, there have always been flashes (get it?) of the giddy playfulness that made the first season such a treat. In the seasons since the first, a lot of that playfulness has come courtesy of Tom Cavanagh, so compelling that when his first character bit the dust, the writers seemingly couldn’t resist bringing him back again. And again. And again. We’ve lost track of which version of Harrison Wells we’re on now, and which Earth this one (Sherloque Wells, the greatest detective in the multiverse) is from, but it looks as though we’ll be getting at least two, if not more, in “What’s Past Is Prologue,” the 100th episode of The Flash. We’ll also be getting Cavanagh in another capacity, since he directed the episode, and thus played a highly intelligent, sometimes bossy know-it-all behind the camera, as well as in front of it. Scott Von Doviak stands ready to wonder how, exactly, Team Flash still thinks solving problems by traveling back in time is a good idea. The Marvelous Mrs. Maisel, season one (Amazon Prime): Amy Sherman-Palladino has been hard at work, and not just the work of pulling her vintage wagon full of Emmys behind her (though that is work, as those things are heavy). No, the real business has been the creation of a second season of Amazon’s delightful The Marvelous Mrs. Maisel, which returns for a second season tomorrow. The first season lasts all of eight episodes, so if you’re half as determined as Midge (Rachel Brosnahan) and Susie (Alex Borstein), you’ve got plenty of time to catch up. Get going, and don’t forget to make yourself a nice brisket.